Passengers flying from Scotland to Ibiza with budget airline Ryanair are now banned from taking alcohol on board due to the firm’s concerns over “consumer safety” following a series of boozy incidents. Last September, a group of drunken passengers were filmed chanting and stamping their feet on the plane journey, while in 2013 the flight was diverted to Beauvais airport because of passengers causing trouble. Any alcoholic substances purchased “must be packed in a suitable item of baggage” which will be placed in the aircraft hold “free of charge,” it said. “Customers attempting to conceal alcohol will be denied travel without refund or compensation,” it added. Planes and trains should let you have a carry on alcohol bag. Ryanair isn’t the only airline to host a series of alarming incidents owing to boozed-up travelers. Last December, London’s Mayor Boris Johnson was involved in a mid-air drama when he tried to calm down a “drunken” passenger on board a Malaysian airlines flight to London. 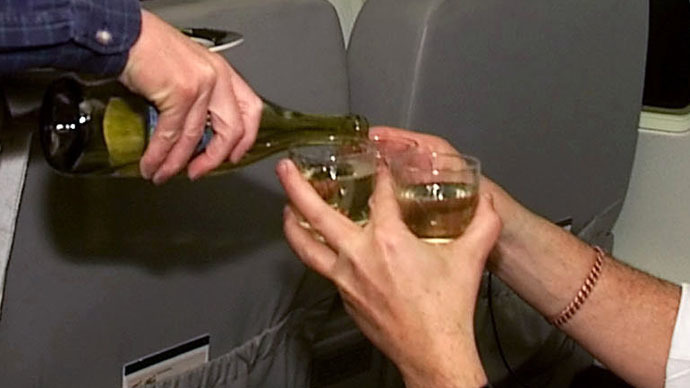 Overall, alcohol-related incidents on flights have risen in the past 5 years, according to figures released by the UK Civil Aviation Authority (CAA). The CAA confirmed over 114 incidents of “disruptive” passengers over the past year, with alcohol consumption among the main causes. The CAA “support UK airlines’ efforts to deal with disruptive passengers to ensure the safety of all those on board,” the spokesperson added.